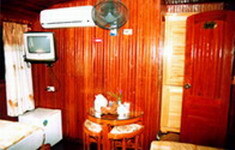 Hai Long Junks offer you the best nights on the board in Halong Bay. Going on Junk, you will have chance to explore the twice world designated natural heritage with 1969 wonderful islands and dozens of beautiful caves with luxury and antique accommodations and perfect services. 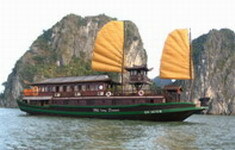 On Junk, you can also enjoy your trip with various activities organized as: watching Vietnamese folk music performance, going fishing at night, learning Vietnamese cuisine. We have 3 kinds of boats to satisfy your demand: Hai Long Dream (series 2003); Hai Long Dream (series 2005); and boats for rent.